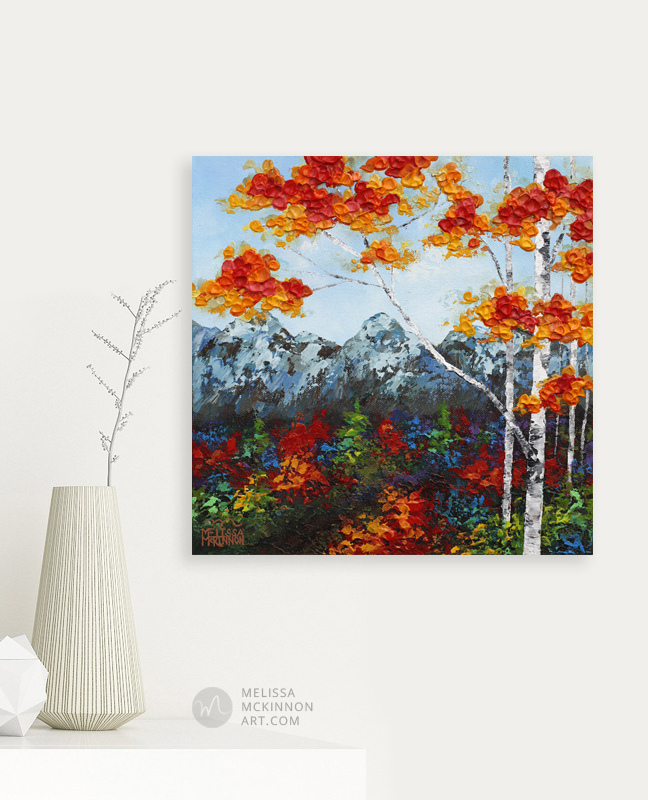 Categories: ALL ORIGINALS, ASPEN & BIRCH TREES, SMALL <24"
Medium: Acrylic painting on 1.5” gallery depth canvas | Signed on the front | Signed, titled and dated on the back. Features: The painted image wraps onto the sides of the canvas so your new art is ready to hang. Framing isn’t necessary, but is certainly possible after arrival based on your tastes and preferences. This painting is sealed with a clear, removable, semi-gloss varnish to enhance the vibrancy of colours and protect your painting from dust, dirt and fading from UV light. Still, it’s best to keep original art out of direct sunlight. Your new painting will arrive unframed, wired and ready to hang straight out of the box – no special tools or handiwork required. A note about colour: All artwork on this site has been professionally photographed and colour corrected to most accurately represent the original painting. Every monitor displays colour differently and may vary from the original work of art. If you’d like to see more detail images before purchase please email me. STEP 2: Any additional shipping costs will be calculated at checkout based on distance and package dimensions. If, for any reason, the amount looks incorrect, please email me for an accurate quote. Buyer is responsible for import duty taxes if applicable in your country. Once your payment has been processed your new painting will be professionally packaged (with love + care) and shipped with a tracking number via UPS directly to your door. Once sent, it’ll take approximately 5-7 business days to arrive at your doorstep. (10-15 for customers outside of North America). Please allow flexibility for delays at customs. As always, I ship worldwide. If you require a quote for international shipping or you prefer to have it shipped rolled in a tube, please contact me.